Ensure you are up to date with your First Aid knowledge and prepare yourself for when an emergency arises. Pools, spas, and hot tubs are attractive to children, and children must be kept away from them in the absence of responsible adult supervision. Never leave a child alone or out of your eyesight in or near the pool, spa, or hot tub—not even for a second. Access to the pool, spa, or hot tub should be limited by locking doors and/or gates whenever swimming or soaking cannot be supervised. Do not allow anyone of any age to swim without a “spotter” nearby. Examples of good safety behavior by adults are important for your children. Always make sure there is ADULT SUPERVISION WITH NO DISTRACTIONS. Drowning is one of the largest causes of accidental death for American infants and children under the age of five. Parents should know that adult supervision is the primary way to prevent accidents. They should maintain constant visual contact with children whenever they are near, or could get near, any body of water. Unfortunately, most accidents occur when there is a lapse in supervision, even for a short time. Pools, spas, and hot tubs are attractive to children, and children must be kept away from them in the absence of responsible adult supervision. A fence, wall, or natural/artificial barrier should completely surround your pool, spa, or hot tub. All gates or doors leading from the house to the pool area should have a self-closing and self-latching mechanism that protects against unauthorized entry and use. The inside latch should be 54″ high, above the reach of toddlers or young children. Also, an alarm system for your pool, spa, or hot tub can warn you, if someone has penetrated the barrier. Check with your state or local government to learn their specific legal requirements concerning fencing around pools, spas, and hot tubs. You cannot be too cautious. If your pool, spa, or hot tub is indoors, lock the door to the room or have a cover that locks, to keep out children. 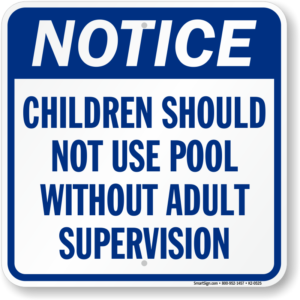 Do not place objects (e.g., chairs or tables) near the pool, spa, or hot tub fence or barrier that could allow a youngster to climb over. If you use a pool, spa, or hot tub cover, carefully read and follow the manufacturer’s directions for safe installation, use, and maintenance. Always completely remove the cover before using your pool, spa, or hot tub to avoid the possibility of anyone—especially a small child—being trapped and drowning under the cover.